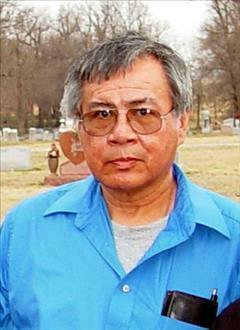 Duane Givens, a resident of Wetumka, passed away Saturday, March 30, 2019 in Wetumka, OK at the age of 71. He was born July 30, 1947 in Hanna, OK to Yahola Givens & Leona (Harjo) Givens. He served in the US MARINE CORP during the Vietnam war and received several medals, including a Purple Heart. He was preceded in death by his parents, sister, Aggie Gouge, sister, Stella Simpson, and brother, Joe Givens. as well as a host of nieces, nephews, cousins, other relatives and friends. Wake services are scheduled for Monday, April 1, 2019 at 7pm at Hillabee Indian Baptist Church in Hanna, Oklahoma. Funeral Services are scheduled for 2:00 pm, Tuesday, April 2, 2019 at Hillabee Indian Baptist Church with Rev. Darrell Coachman and Rev. J.B. Fish, officiating. Interment will follow at Hanna Cemetery. Services are under the direction of Integrity Funeral Service in Henryetta.